The Flourishing Earth Project is the latest chapter in a story of friendship, commitment, sharing of talents, and a collaborative effort to make a positive contribution to the future of our species and our planet. Cheryl and Russ Genet were childhood friends who went separate ways and did not see each other again for nearly four decades. They reunited, fell in love, married, and started a new life together. Russ Genet and Dwight Collins met in the Air Force over 30 years ago and have been best of friends through many life adventures. Dwight and Cheryl met, of course, through Russ and all three bonded in their mutual vision for the future. Dwight Collins retired from a business career in Operations Management and is now a founding instructor at the Presidio School of Management in San Francisco (green MBA program). He also founded the Collins Family Foundation (CFF), a non-profit whose mission is to provide leadership in humanity’s efforts to live sustainably on planet Earth. The CFF has been the primary supporter of the Humanity Series Conferences that were launched in 2007. These Humanity conferences, inspired by Russ book Humanity: The Chimpanzees Who Would Be Ants (a science story of how we came to be and what our future might be), were co-convened and chaired by Russ Genet (Research Scholar in Residence at California State Polytechnic University and Adjunct Professor of Astronomy at Cuesta College—both in San Luis Obispo, California) and Cheryl Genet (Adjunct Professor of Philosophy, also at Cuesta College). The final conference in the series Science, Wisdom, and the Future, generated the idea and momentum for the Flourishing Earth Project. The conferences are unique in that they are broadly interdisciplinary in their approach to dialogue between science, the humanities, and cultural research and wisdom. Cheryl carries on this multi-perspective dialogue in many forms as Director (and founder) of the Orion Institute (OI), in cooperation with the Collins Family Foundation and its publishing division, the Collins Foundation Press, of which she is the Managing Editor (Dwight is the CEO). The Orion Institute generates and collaborates with opportunities for life-long learners (of all ages) to explore scientific paradigms, cosmological stories, interfaith relations, and our emerging global community. The mission of the CFP is to publish top-quality books that engage readers in broad interdisciplinary discussions of humanity’s scientific, political, social, philosophical, theological, and artistic endeavors towards creating a flourishing and sustainable future. Russ remains in an advisory capacity to theOrion Institute and Collins Foundation Press but has recently reinvigorated his participation in ground-breaking developments in Astronomy. His Alt-Az Initiative is inspiring the R & D of a new generation of lightweight, alt-az research telescopes. Russ is documenting these developments in an astronomy book series published by the CFP. Science is always the foundation for Dwight, Cheryl, and Russ’ work, but they recognize that humans have varied responses to, and uses of, the knowledge that scientific research brings to the human experience. 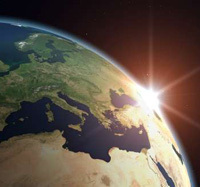 It is our hope that the Flourishing Earth Project will move the efforts of the Press and Institute into new dimensions through social media, expanded conference topics, and a series of books and other publications that contribute to the vision and implementation of a sustainable future and a flourishing Earth.